Fat or not, Tuesday just isn’t the most practical day to throw a party. That’s why I’ve picked this slow cooker pork and black bean dinner as my choice for Cinco de Mayo, which falls on Tuesday this year. The dish straddles the line between weeknight slow cooker simplicity and stick-to-your-ribs fiesta food. Even though Frijol con Puerco is traditionally served in the warm climate of the Yucatán, I’ve found it super satisfying in cooler weather, which, unfortunately, tends to linger here in Chicago for longer than we’d like. I’ve called for canned fire-roasted tomatoes for the tomato-green chile sauce, but if you’re able to harvest fresh tomatoes from your garden or farmer’s market, roast those and blend them for the braise. Another note: This recipe calls for either serrano or jalapeño, but if you’re striving for Yucatecan authenticity — and can handle a nice dose of heat — use 1/2 to 1 whole habanero. This dish is pretty complete by itself, though you may want to prepare either white rice or a leafy salad, perhaps both, as accompaniments. 2fresh hot green chile (such as serrano or jalapeño), stemmed and roughly chopped into small pieces (in Yucatan, they’d use ½ to 1 habanero). To ensure that the dish has the richest taste, first brown the pork. In a very large (12-inch) skillet or the removable, stove-top-safe insert to a slow-cooker, heat 2 tablespoons of the oil or pork lard over medium-high. When hot, add pork shoulder in a single, uncrowded layer. Sprinkle it generously with about a teaspoon of salt and, as the cubes brown, turn them until they’re browned on all sides, about 10 minutes. Either scrape the meat into the slow-cooker or transfer the slow-cooker insert to its base, then add 1 ½ quarts water, black beans, 1 of the white onions, and epazote. While the meat and beans are cooking, make the tomato-green chile sauce. In a very large (12-inch) skillet, heat the remaining 2 tablespoons of oil or lard over medium-high. Add the remaining white onion and stir until it begins to brown. While the onion is cooking, scoop the canned tomato into a blender and pulse it a few times until coarsely pureed. Pour the puree into the pan with the onions. Then add the serranosand cook, stirring regularly, until the mixture is thick enough that it will hold its shape in a spoon. Season the sauce with salt (it usually takes a ½ teaspoon) and stir half the mixture into the beans. Then season the meat and beans—it usually takes 1 ½ teaspoons more salt. After a few minutes of simmering, the dish is ready to serve. Ladle it into bowls, spoon a little of the remaining sauce on top and dot with avocado, cilantro, and radish. Can’t wait to try! Love the Yucatan and it’s food. Thanks for posting your fabulous recipes. I have watched your shows for years and use several of your wonderful cookbooks. I now live in southern baja and love it. I enjoy getting your emails and am never disappointed with your recipes. We have watched your empire grow and congratulate you on your success. You deserve it all! I would like the recipe to your cinco de mayo Red Rice made in a slow cooker that was on your Show on TV Sunday May 3 2015, PLEASE, THANK YOU! Here it is! This is a dish for a rice cooker. Enjoy! Hello all. 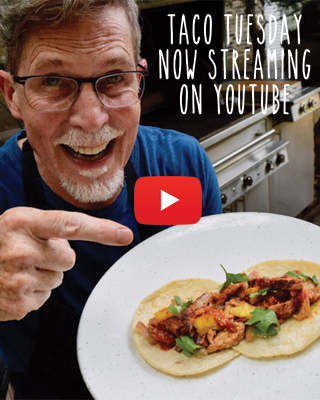 I am a major fan of Rick Bayless and this type of cooking! I am looking forward to being able to see the new cookbook. However, I do have one question, I made the Frijol con Puerco in my slow cooker yesterday. I was disappointed, as it seemed to be very watery and the beans were tough. Any advice? Thanks! Thank You ! Katy will try it tonight . I would like to know what slow cooker you use. It looks great!!! I have tried several of your recipes, loved them and LOVE your show. 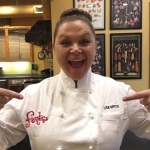 I always get a smile on my face when I realize it is Rick Bayless night! Rick used an All Clad and a TRU on the TV show. Both had cast iron stovetop safe inserts – but most slowcookers inserts are not stopvetop safe – always check before trying. Awesome show. I’d like the recipe for the beans and pork that Rick put inside a French bread I think he used a George Foreman grill to grill it. Does the recipe really call for 128 oz can diced tomatoes? or is it a typo? thanks! Good looking out: it’s one 28-ounce can. We’re aware that it looks strange – it’s a function of our recipe tool. We’re on it! For how many people is this recipe? The recipe can be made for 6-8 people but if you are really hungry 4-6 people.. 🙂 Happy Cooking! I’m currently frustrated with this recipe. I love Rick Bayless, but this recipe is not written correctly. Is it 6 hours on High or Low? You mention both temps in the recipe. I’m at 6 hours on low and an additional 2.5 on High. The sauce portion is great but the beans portion can not be trusted if your cooking this meal within any kind of time frame for invited guests. Review the recipe and see if I’m crazy. In my opinion it needs 6 hours on High. 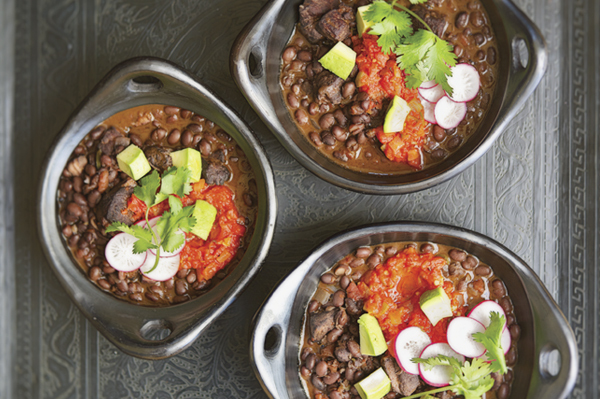 In the cookbook More Mexican Everyday, this exact recipe says to cook on high for six hours. Can you tell me which is correct? Hi Karen-The longer you cook the pork the more tender it will be. I would cook on high for 6 hours or low for 8-10 hours. Good Luck! Ok, now I am confused. I have all the items and wanted to make this this weekend. The recipe above states to turn crock pot on low and it will be done in 6 hrs. yet you write above to cook it on high or low for 8-10 hrs., which is it? Also, is the tomato sauce getting added at the end, right before serving or some other time during the crock pot cooking? We say that because every crock-pot is different, so the baseline answer is cook on low for 8 hours or high for 6 hours, sorry for the confusion. The tomatoes should be added before the cooking process, you want all that amazing flavor to be cooked in. Ok, I made it before you posted. I went with low for 8 hrs. and it turned out. Meat was falling apart. I would clarify your recipe concerning the tomato addition. In your replly, you state to add the tomato mixture at the beginning, letting it cook for the 8 hrs. However, in the recipe, it states “after a few minutes of simmering”. This statement, coming right after putting the tomato mixture together would lead one to thinking you add it right as the pork/beans are getting done (which is what I did). It may be better if you omit the “after a few minutes of simmering” statement as that does not fit with adding the tomato mixture in the beginning to the pork/beans. 2) When should I have added the tomato-chili mixture? I thought I was supposed to add that to the slow cooker just a few minutes before serving, and after all the slow cooking was basically done. But from comments above, now I wonder if I should have added it at the beginning.